The KONG Classic is an irresistible, robust dog toy made from natural rubber. Available in various sizes. The best dog toy in the world! KONG dog toys have a unique shape, are made from strong rubber and are used by millions of dog owners worldwide. The KONG Classic is an irresistible toy for every dog! The KONG Classic bounces well and can be filled with food or dog biscuits. Hours of fun guaranteed! 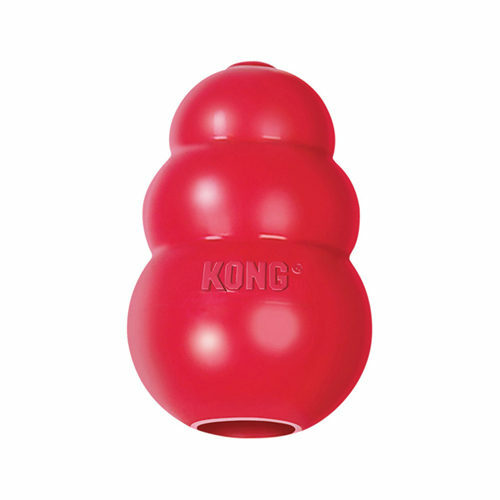 The KONG Classic can also be an effective tool to prevent dogs eating too fast. See a YouTube video of the KONG Classic in action. Have you used KONG Classic before? Let us know what you think about this product.